Yeah, it has been a while. I have been busy, but that is just my excuse for laziness. Since the last post, I did my first ever Tour de Donut. 32 miles with 2 rest stops where they serve big glazed donuts. For each donut you eat you get 5 minutes off your time. Sounds counter productive huh. It is not a serious race - it is a fun race! And it was really fun. Carisa did it on her road bike and I took the tandem with Freddy on the back and the Fred's pulled Jenna in the trailer. The kids were very excited about the ride. At mile 6 - Jenna started yelling "Where are the donuts, I'm ready!" Needless to say when we got the first stop around mile 12, I tried to give Jenna a bite of my donut and she announced "No, I want my own with sprinkles on it!" Once I explained they were all the glazed variety she had totally lost interest in the ride, Ha! 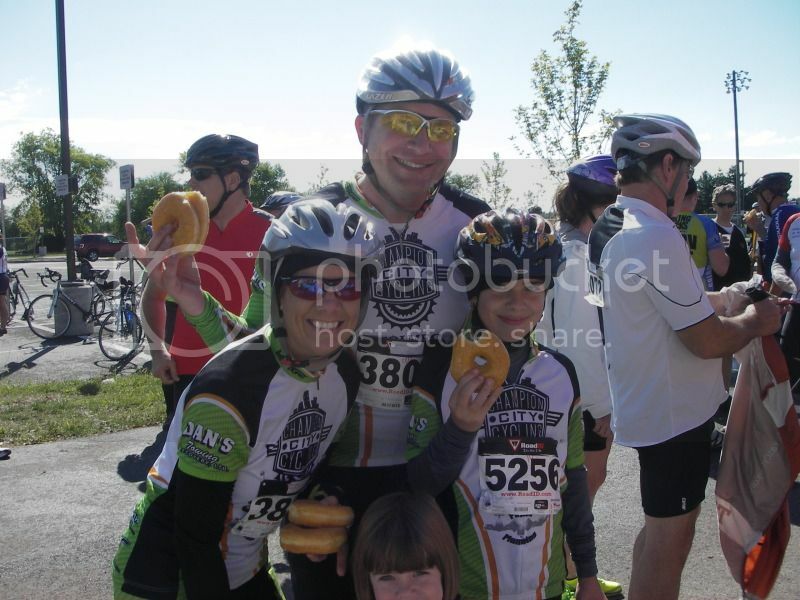 Freddy had 2 donuts at the first stop (the same with myself and Carisa). We took back off and cruised down the road. Everyone just talking and hanging out. There were so many riders of all strengths, you always were passing or being passed by riders. When we got to the last stop - everyone had more donuts and we watched as we saw a guy working on number 16. Thin little dude, I'm thinking how can he do that and not be in a diabetic shock? He was crouched down on the ground hovering over his cup of water as he dunked the donuts in there before eating them. Umm.. yeah.... Fred out... I'm not into competitive eating and watered down donuts do not appeal to me. Anyways - we finished the ride and everyone had a great time - I'm pretty sure we will be back again next year. Donut count this year... Fred 4, Carisa 4, Freddy 3. We even went to Farmer Brown's on the way home and got a pizza to go and had it in the car on the way home. Definitely recommend this place (Have to have the Farmer Brown sandwich). 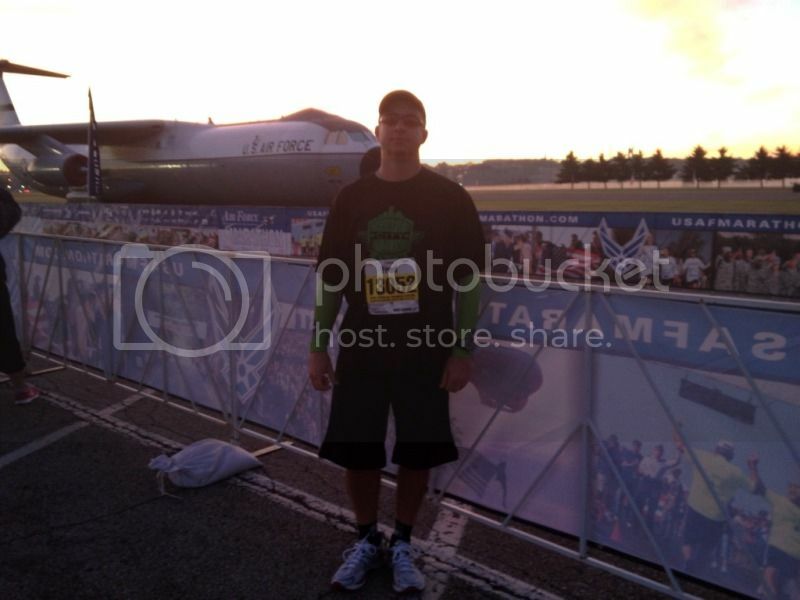 The next weekend was the Air Force Marathon. Carisa was signed up for the 1/2 marathon and I was signed up for the 10K. Yeah we signed up right after New Years - all those fitness resolutions and stuff... why oh why. Carisa got on a training plan this time (this was now her 2nd 1/2 she has completed), and I wasn't so much on a training plan. I didn't run the first of the year for fear of soreness or injury preventing me from a good Mount Mitchell ride. Then I had every other excuse I could come up with..... 2 weeks before the race I went out and ran 4 miles cold turkey. Just to know I could do it, 12 minute miles... at least I was moving and not walking. Horrible pace but I felt like I could keep going no problem. I intended to run a few more times before the race but that never happened. The day before I knew I had to do something. So I figured if I could run 2 miles and see how I felt I would know how much Motrin to take before the race to make it. I go out and the first mile was 8:34 pace.... I stopped there and walked back home. I wanted to finish on a good note. Saturday morning and up early to head to WPAFB for the race. The full marathoners and 10K'ers all left at the same time. I just kept running watching other people - keeping it in my mind if they can do it so can I. I ended up a 59:11 for the 10K - got it done in less than an hour. Nice! Needless to say that is the farthest I have ran in my life and I have no interest to do it or any more in my future. Carisa got done in less than 2 hours... got her goal. The course got screwed up with the 1/2 runners some ran more and some ran less, I guess that is how it goes. Now on to my newest adventure. Cyclocross. Yes, thin mountain bike type tires on a road bike. Includes running over barrier obstacles and riding as fast as you can for 30-45 minute races. All while dodging other riders and sliding in the mud. I figure this should help me keep my fitness over winter and increase my bike handling skills. 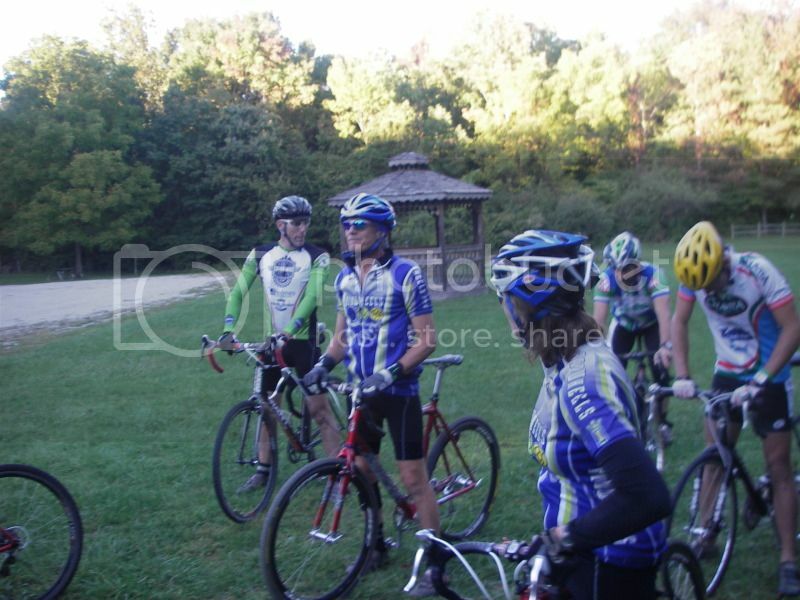 This is the picture from my first cross practice. I learned if I am not anaerobic I am not going hard enough and it is very important HOW to grab your bike to get over the barriers and even more importantly how to properly jump back on the bike (even though I have been catching myself doing the stutter step). This is so much fun, hard work, but I can see if I stick with it, it will definitely pay off next year.